This home is part of a beautifully renovated historic estate in downtown Ennis. A cozy hand hewn log cabin tastefully decorated with western furnishings, original art, quality linens, and more. Walking distance to downtown Ennis on a private estate with a swimming pool and hot tub. 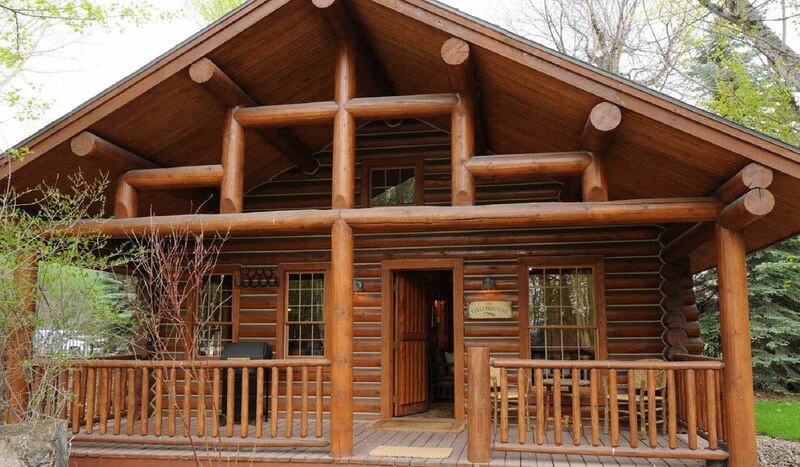 The Yellowstone Cabin can be rented by itself to accommodate up to 4 guests, or add the Madison Cabin for 4 more guests and the Main House for 6 more guests. Ideal for a large group! A small swimming pool is shared by the three homes on the estate, a rare find in southwest Montana. The Yellowstone Cabin has two bedrooms each with a queen size bed. Brief Description: The Ennis Homestead is a first-class historic estate in the center of Downtown Ennis. The estate is composed of three cabins which can be booked separately or reserve the entire estate for your large group or family reunion. You'll be walking distance to restaurants, galleries, shopping, and more. Bedrooms and baths: The Yellowstone Cabin is identical to the Madison Cabin. Comfortably appointed for one or two couples with two bedrooms each with a queen size bed and luxurious linens. The cabin has one full bathroom. Kitchen: The kitchen is small, but fully equipped with all the amenities you'll need to prepare a meal at home. Living Room: The comfortable living room will have plenty of seating for gathering to tell stories about the day's adventures. There is wireless Internet for your use as well as a television with satellite service in the living room. Outdoor amenities: The estate has a lovely grounds with mature trees, plenty of space separating the three cabins, a swimming pool and hot tub. Each of the cabins has it's own outdoor grill and a small deck with outdoor seating. Services available: The rental rate includes an end-of-stay cleaning. Guests staying two weeks or longer will enjoy a weekly "spiff up" cleaning during their stay. Additional housekeeping can be arranged with a bit of prior notice. Activities nearby: Fishermen will have plenty of choices of where to go: the Madison River, in Yellowstone National Park and on the Henry's Fork of the Snake River. Other great activities include hiking, mountain biking, shopping and dining in the small western town of Ennis, and visiting historic Virginia City. For an especially memorable experience in the park, book a specialized private tour with our sister company, Greater Yellowstone Guides.